SFIAAFF '09 Student Delegate – "day 1: my dear enemy"
By Rebecca Chan Basically what gets the plot rolling in My Dear Enemy, directed by Lee Yoon-Ki, starring Jeon Do-Yeon as ex-girlfriend Hee-Su and Ha Jeong-Woo as ex-boyfriend Byong-Woon. Hee-Su tracks down her ex in some racetrack bidding place and basically drives him around Seoul in search of people that he knows that would lend him the money he owes her. It is time that the $3500 I lent you last year so that you could “save your business,” comes back to me. That’s right, I want it back beezee. Basically what gets the plot rolling in My Dear Enemy, directed by Lee Yoon-Ki, starring Jeon Do-Yeon as ex-girlfriend Hee-Su and Ha Jeong-Woo as ex-boyfriend Byong-Woon. Hee-Su tracks down her ex in some racetrack bidding place and basically drives him around Seoul in search of people that he knows that would lend him the money he owes her. The whole journey of being in a car and not-so-intentionally/intentionally bumping into these people have let the audience take a glimpse at the characters and their interaction. Hee-su, who somehow manages to look like a wide-eyed but lethargic Eeyore, makes me worried that she would lose it any minute and ram her car into a building. Byong-Woon, her antithesis: unreliable, not serious, a B.S. spokesman who talks on and on and on… But above all, he is charismatic and good-natured, someone we like and laugh at/with despite Hee-su’s obvious distaste for him. She is cold and detached for 99% of the film while he is endearing, talking about the exotic rice wine shop he wants to open in Madrid, Spain. The most important thing about him though is that despite his uselessness, he does not speak lies, as far fetched they sound. The cinematographic aspects of the film are not slow but it takes its time, like the way Byong-Woon takes his time in searching for his contacts, like the way Hee-su is impatient, yet she still waits. The saturated feel definitely enhances the wintry feel of the city (Lee Yoon-Ki calls the atmosphere cold and hostile; sort of like Hee-su). The pacing does get lethargic at times, like the way Hee-su appeared to us (was it the eyeliner? it could be the combination of that and her huge doe eyes), and as we progress throughout the film, we see her anger dissipate into a sort of frazzled, lonely mess. Like the moment they go pick up B-W’s niece, her car gets towed away and she has a melt-down, a possible mental juxtaposition of the situation as well as her own internal loneliness. 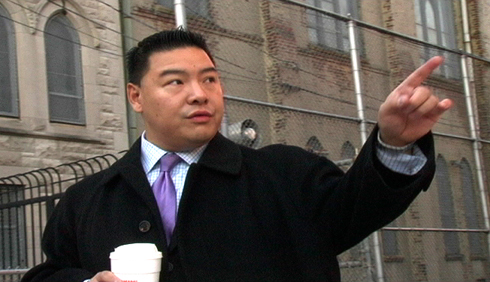 Hey Hee-su, after hours of dragging/following your ex around the city for your lost cash and then losing your car? I’d cry too. Overall? It was good; a pleasant ride engaging with two polar opposites and the events that occur. Anti-romantic undertone? Have to say it was present but it didn’t run the course of the movie. Hectic trying to get there; must leave earlier next time; do not get frustrated at volunteers at door; also try to look more presentable instead of like disheveled college student. Which I am. But despite that, good start to the festival! I tried to transcribe the Q&A post-screening but none of it really makes sense and I’d be paraphrasing anyhow so I don’t want to put the wrong words in the wrong people’s mouths. Comcast on Demand Films ‘Pacifika’ Playing in April! 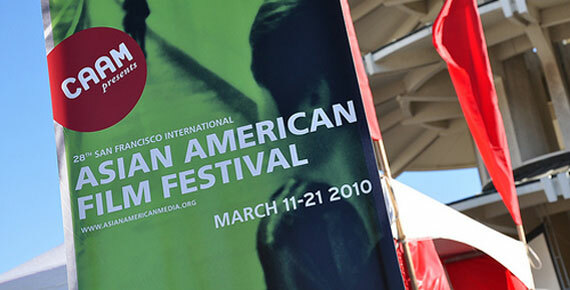 The 28th SFIAAFF: A Look Back… Oh, What a Week It Was!